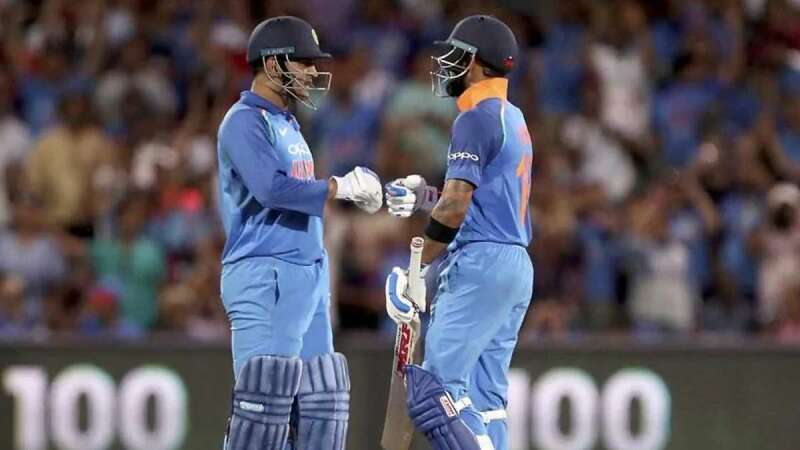 Adelaide : India rode skipper Virat Kohli's magnificent century followed by stumper Mahendra Singh Dhoni's unbeaten half-century as India defeated Australia by six wickets to level the three-match rubber 1-1 at the Adelaide Oval here on Tuesday. Chasing a competitive 299 for victory, the tourists banked on a collective batting effort from the top order, before a 82-run fourth wicket stand between Kohli (104) and Dhoni (55 not out) ensured the team's win with four balls to spare. Medium pacer Bhuvneshwar Kumar also starred in India's win by picking up four wickets, while Mohammed Shami contributed well with three scalps. Incoming batsman Kohli then joined the opener and the duo took their side past the three-digit mark in 17.4 overs before Rohit fell in the next delivery by Marcus Stoinis. Rohit's top edge was taken safely by Peter Handscomb at deep forward square. Kohli was then joined by Dhoni and their crucial 82-run partnership drew India closer to a victory. Enroute, Kohli also notched up his ton off 107 balls. However, the Indian run-machine failed to carry India through the finishing line as Jason Behrendorff sent him back in the 44th over with India's score reading 242/4. However, Ravindra Jadeja's brilliance on the field cut short Khawaja's stay.